No Flash On The iPad? 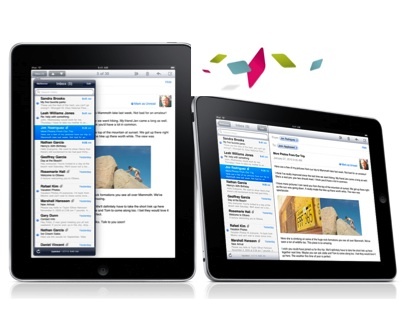 The lack of Flash on the iPad is a sore point for many and often listed as one of its greatest potential weaknesses. Not allowing Flash on the iPhone is bad enough, but on the larger iPad with full-screen browsing, its absence will be much more noticeable. Or will it? Already the Web is adapting. Videos powered by Brightcove, for instance, will stream in an HTML5 video player when it detects an iPad. On the iPhone browser, the video thumbnail will open up the Quicktime player. It will also work on Android phones. Brightcove CEO Jeremy Allaire is agnostic about the Flash Vs. HTML5 debate. “HTML5 is great,” he says. “It is an open standard, and firmly entrenched in the Apple device platform. Flash can’t reach those platforms for political and business reasons.” But HTML5 simply cannot do everything Flash can, especially when it comes to supporting advertising, audience measurement, customized players, and social sharing. So he decided to bring HTML5 video to parity with Flash for anyone who uses Brightcove. (Note that this is for videos playing in the browser. Brightcove already supports video playback in iPhone apps). It will take until the end of the year to reach full parity with Flash, but that is his goal. 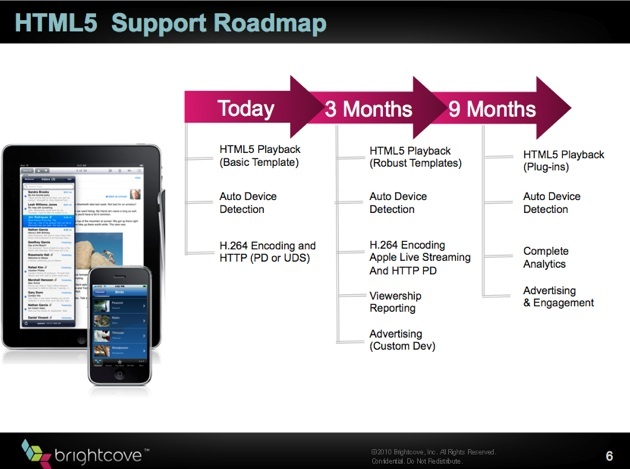 At first, Brightcove videos will play back in a very basic HTML5 player when they detect an iPad. But over the next nine months or so, Brightcove will add the same audience measurement and advertising features available in its regular Flash player. Brightcove will still display the video in Flash when the viewing device supports it, but for the iPad, iPhone, and even Android phones, videos will play in HTML5 and most viewers probably won’t notice the difference. Already today you can see who these videos work on the iPhone. For example, Brightcove turned on the capability for Techcrunch videos such as this one when viewed in an iPhone browser. When the iPad comes out, you will be able to watch our videos on there as well, along with videos on the sites of the New York Times and Time magazine, who also use Brightcove. Making HTML5 playback available is just something all video platforms will eventually do. Ooyala is set to offer it for the iPad as well, and YouTube is moving in that direction as well. Thanks for sharing this informative content with us. We are working on html5 video player . It is really helpful for me and I get my lots of solution. Thanks for sharing this informative content with us. We are working on Linux on Android without root . It is really helpful for me and I get my lots of solution.